First the individual must heal, then the family can begin healing; then the community can start to heal; and then the nation can heal. 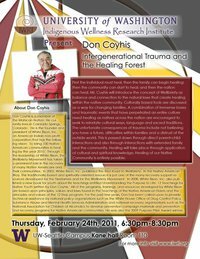 Mr. Coyhis will introduce the concept of Wellbriety as balance and connection to the natural laws that create healing within the native community. Culturally based tools are discussed as a way for changing families. A combination of immense losses a…nd traumatic events that have perpetrated an entire culture need healing as natives across the nation are encouraged to seek to reinstate cultural ways, language and sacred traditions. The unfortunate consequences of trauma include not believing you have a future, difficulties within families and a distrust of the outside world. This is passed down through direct parent-child interactions and also through interactions with extended family and the community. Healing will take place through application of cultural and spiritual knowledge. Healing of our Native Community is entirely possible. Even if you cannot attend, please share this event to others who may wish to attend. If you park in the garage across the street from the school of social work on 4101 Fifteenth Avenue Northeast, Seattle, WA 98105-6299.
travelling South on 15th ave, turn left into underground parking garage and ask the parking attendant what level to park for direct access into Kane Hall. This entry was posted in Make No Bones About It and tagged Connecting with Spirit, Intergenerational Trauma and the Healing Forest, KAOS 89.3 FM, Lonny Peddychord, Make No Bones About It, Native American Indian, Olympia, Raven Redbone, Wellbriety, Whie Bison. Bookmark the permalink.